The Zimmerman family has been making and selling peanut butter in Central Pennsylvania for over a century. Started by John S. Zimmerman in 1915, Zimmerman’s Nuts & Candies is now run by John’s grandson, Lee, Lee’s wife Donna, and their daughter Olivia. They may have added a few items to their lineup over the years, but not much has changed about the shop. And not much has changed about how they make their peanut butter either. It still has just two ingredients: roasted peanuts and a little salt (a salt free option is available). 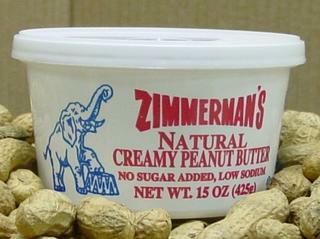 Zimmerman’s peanut butter is a Central PA tradition — pure, simple, and a yummy staple of our pantry.